From stylish pillows to vintage books to customizable jewelry, these Eastside Etsy shops are full of locally-crafted treasures. So whether you’re looking for a gift or shopping for yourself, you’re sure to find a few goodies from the talented makers below. Simple, stylish pillows. We want one in every color. The perfect print for that blank spot on your wall. Dainty, classy jewelry for everyday wear. Read about the shop’s founder on 425 Business. We don’t care that Christmas is over. 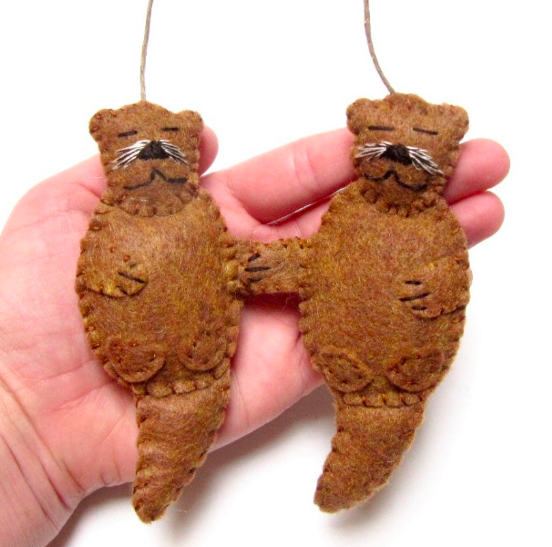 We want to display this “pair of otters” ornament all year long. Because books are better when they’re charming and vintage. 3D-printed homes for bees. Need we say more? Cupcake toppers for almost every interest and occasion, including fishing, barbecue, and Ramadan. A shop full of curated vintage items, like this leather satchel that we absolutely need. Handmade, Pacific Northwest-inspired goods. Read about the shop’s founders here.